THIS MOD IS OBSOLETE DO NOT USE UNLESS YOU WERE USING IT ON A 1.1.7 SAVE FILE AND WISH TO GET THE VANILLA 1.1.8 TRADELIST ON IT!!!!!!!!!!!! legacy version will only trade 10 leather a week (like the vanilla game), if you want to trade more leather you can still use version 1.0 of this mod. Install: Use the ingame mod interface, should be pretty self explanatory. Use: When starting a new game, click on the balancing option and choose "#BALANCING_NAMES.Leather Be Gone"
Not happy with not getting any gold at all? 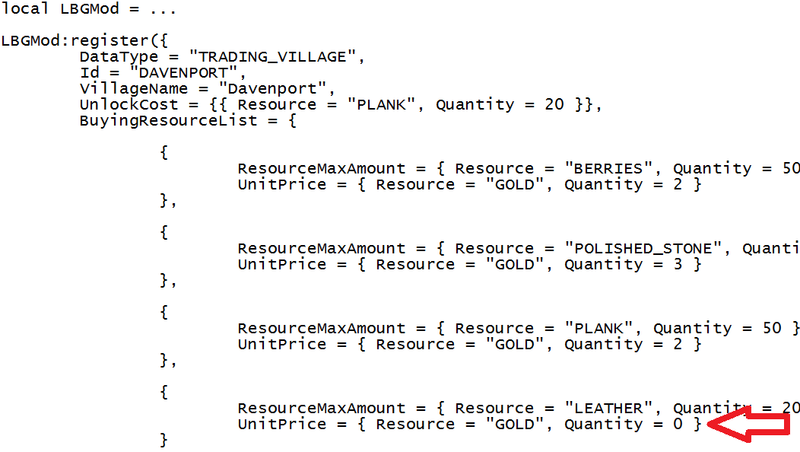 Changing how much gold you get for each leather is easy. Just go to C:\Users\YourUsername\Documents\Polymorph Games\Foundation\mods\469 , open the file called "Balancing.lua" in notepad, and change the number the red arrow is pointing at.